Surgery is only one step in the process of undergoing deep brain stimulation therapy (DBS). In preoperative screening, diagnostic tests confirm the underlying condition and also evaluate whether the patient is a good candidate for DBS. Preoperative tests can include motor testing, quality of life assessment and neuropsychological evaluation. The best DBS candidates who have Parkinson’s disease will be moderately impaired yet still functioning well when their medications are working, have realistic expectations, a good support system, and convenient access to programming. Brain scans are an important first step. High-resolution magnetic resonance imaging (MRI) and computerized tomography (CT) help visualize the location of the initial target area. The MRI may be taken ahead of time. A CT scan is usually performed using a rigid metal stereotactic frame, which serves to hold the patient’s skull in place while the entry point and initial target are selected. More recently, frameless and mini-frame systems have been developed, offering similar accuracy and greater patient comfort. There are a number of different ways of performing DBS surgery. The procedure will vary depending on disease characteristics and whether the surgeon needs the patient awake to test the effect, or can perform the procedure under general anesthetic. Once the target location and path are mapped, the patient is given an intravenous sedative. The surgical field is numbed with local anesthetic. The surgeon drills one or two holes (on each side) in the skull that range between 3mm and 14mm (about the diameter of a nickel). Some surgeons will mount an apparatus that guides the test electrodes along pre-planned paths. Other surgeons do not use test electrodes if the target is obviously visible on the MRI scan. In the case of an “awake” procedure, the sedated patient is then allowed to wake up fully before electrodes are slowly advanced to the planned target in the brain. 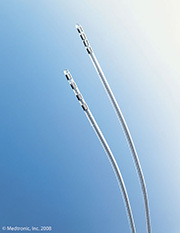 Caption: Leads - photo courtesy of Medtronic, Inc.
Microelectrode recordings are sometimes used to confirm the target. As a microelectrode is inserted along the target path, neural activity is translated into a chirping sound and amplified to help guide the surgical team as they listen for characteristic firing patterns from different regions of the brain. Test stimulations are carried out to help refine the target further. The patient will be asked to move, talk and report symptoms. After the desired target is located, the actual DBS electrode is inserted and tested. If microelectrode recordings are not used, the definitive DBS electrode will be passed to target at this stage. One or two leads, each with four 1.5 millimeter electrodes, will be implanted. Placing the leads in the proper location usually takes two to four hours, but may take as many as eight. The procedure can be tiring, but is not painful. While the patient is under general anesthesia, the battery or pulse generator will be implanted under the collarbone. To connect the pulse generator to the leads, a thin wire is placed under the skin and threaded along the neck and behind the ears. Many centers do this step another day, giving the patient time to rest at home. About a month later, the patient returns to have the DBS turned on and programmed. The clinician will hold a wireless radiofrequency device over the implanted pulse generator to adjust stimulation parameters. Wide ranges of settings are available, including electrical polarity, voltage, frequency, pulse width and rate. It may take several sessions to find an optimal setting. 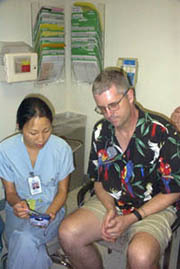 Caption: Following surgery, DBS patient Joel Davis receives instruction on his remote controlled stimulator from nurse practitioner Christine Na-Lee, his Kaiser Permanente case manager. Photo taken in 2004 by Kelly Johnson, reproduced with her permission. At the optimal stimulation settings, a Parkinson’s patient will feel the body loosen up and movements improve – much like occurs when medications are in effect. With DBS, the patient may experience longer symptom-relief time, and generally can decrease medication to reduce side effects. Stimulation for Parkinson’s disease is usually continual, and maximal benefit may be seen in a few months. At home, patients have a remote control they can use to check battery life and turn stimulation on or off. If a patient experiences any uncomfortable or unwanted effects such as numbness, tingling or twitching during deep brain stimulation, those sensations generally go away once the stimulation has been turned off, and settings can also be adjusted if necessary. Stimulation settings can also be adjusted over time to ensure the best control of symptoms. Approximately every three to six years, minor surgery will be required to replace the battery. Bleeding in the brain – this has been reported to occur in less than 3% of electrode placements, causing permanent deficits from stroke in less than 1% of cases. Infection or skin erosion may develop. Infection rates have been reported to be less than 10%, which is similar to other neurosurgical procedures. Infection usually requires hardware removal, as well as antibiotic therapy. There are some reasons DBS may not be advised. These include dementia, inadequately treated psychiatric illness, extensive brain atrophy, and the presence of medical conditions that preclude safe surgery. Patients should not undergo DBS implantation if they anticipate needing future MRI scans of the body (brain MRIs are usually OK). Most importantly, each patient is advised to become fully informed and think over pros and cons carefully when considering deep brain stimulation therapy. A patient who is moderately impaired by Parkinson’s disease may want to consider the procedure when optimal medical therapy does not provide satisfactory control of symptoms.